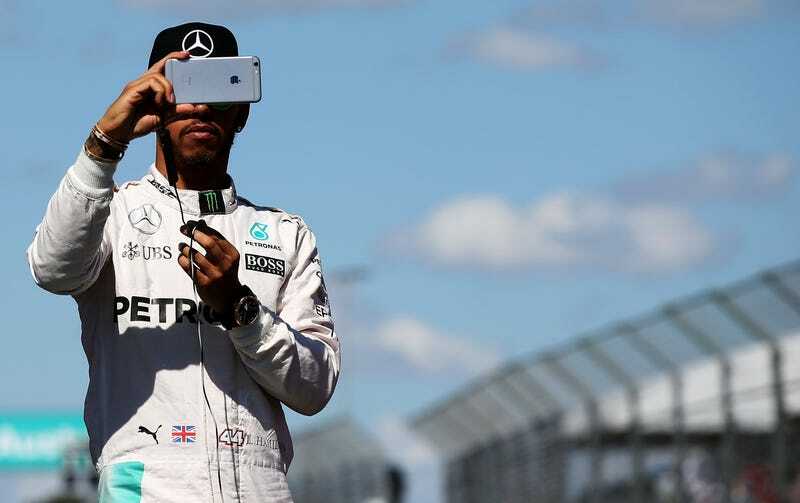 Lewis Hamilton has a thing for using Snapchat. Formula One Management has a thing for protecting its incredibly exclusive broadcast rights. Those two things don’t mix well, and F1 head honcho Bernie Ecclestone put a personal ban on Hamilton’s Snapchat use in the paddock—which Hamilton broke that very day. He continued to explain to Germany’s Auto Bild: “I remember at the beginning of my career Ron (Dennis) told me it was time to get a haircut. If someone told me to do that again I wouldn’t, but at Mercedes nobody does anyway. “It was a process that makes me the man I am today. And everyone is different,” Hamilton added. Everyone is different, but a rule is a rule. But Hamilton—the pole sitter for the Bahrain Grand Prix on Sunday—went ahead and broke it, and reports surfaced about his rule-breaking Snapchat story on Friday and Saturday. The Snapchats do indeed show Hamilton entering the track, meeting fans and sending out footage from the garage area. Perhaps one of the most interesting posts was one taken by someone else of Hamilton sitting in the garage, which means he isn’t the only one who defied Ecclestone. In an era when teams and drivers use social-media platforms such as Snapchat on a regular basis, Hamilton’s Snapchat ban could be considered an odd one in the first place—having a top driver share things from such a popular platform could easily benefit F1, and the original report from newspaper Bild Am Sontag has no official word from Ecclestone as to the specific reasoning for the ban. But for now, it looks as if Hamilton hasn’t stopped with his Snapchats from the F1 paddock—for whatever reason, be it personal expression or something else. Perhaps the quickest method to find out why would be, well, with a Snapchat.